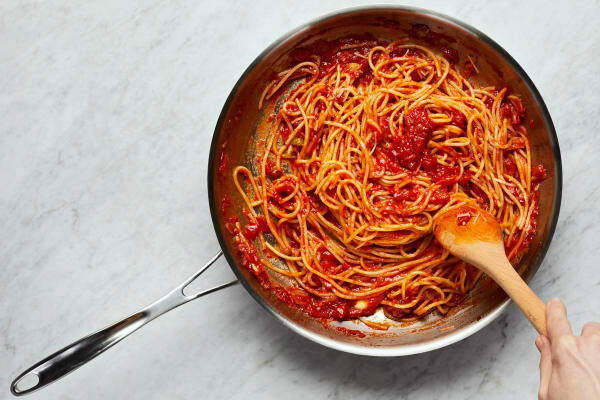 Spaghetti and tomato sauce just got a flavorful makeover--and it’s got heads turning. 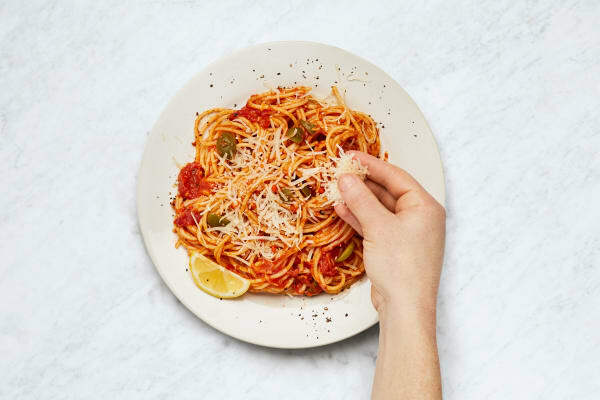 This gussied-up classic is all about bright and exciting flavors: briny bites of green olive, thinly sliced garlic, and a touch of chopped fresh chili add serious oomph to marinara. 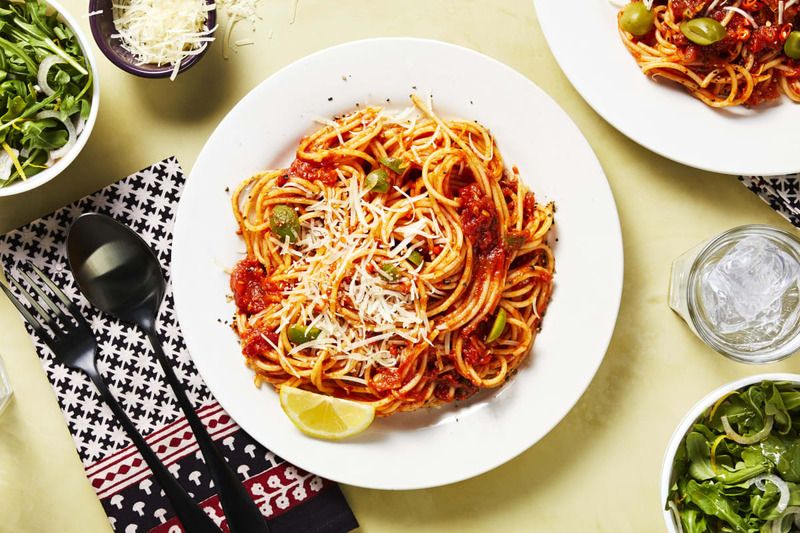 This super savory melange coats twirly, al dente spaghetti for an extra-hearty and satisfying experience. On the side, there’s a heap of lemony arugula salad (because we’re all about balance). Bring a large pot of salted water to a boil. Wash and dry all produce. Peel and thinly slice shallot. Thinly slice garlic. Zest lemon until you have ½ tsp; quarter lemon. Roughly chop olives. 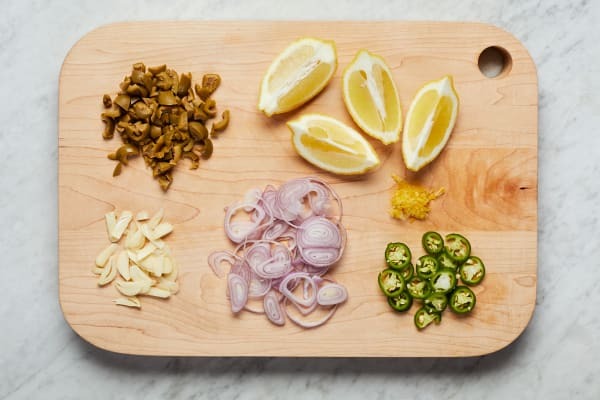 Thinly slice chili. 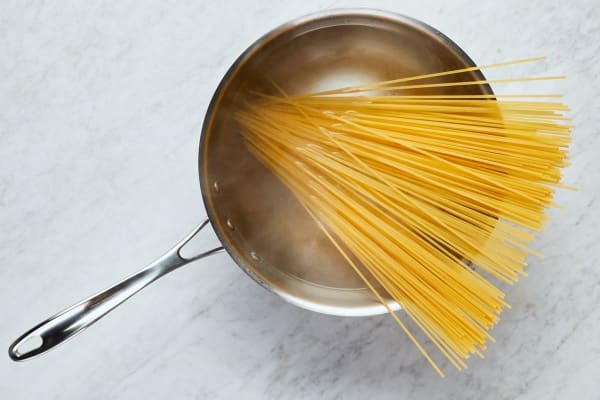 Once wateris boiling, add spaghetti to pot. Cook, stirring occasionally, until al dente, 9-11 minutes. Reserve ¼ cup pasta cooking water, then drain. 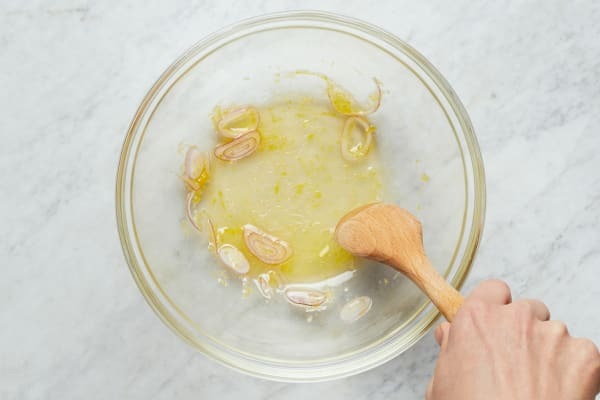 Meanwhile, in a medium bowl, whisk together juice from 2 lemon wedges, a drizzle of olive oil, and lemon zest until combined. Stir in 1 TBSP shallot and season with salt and pepper. Heat a large drizzle of olive oil in a large pan over medium heat. Add garlic, half the olives, and remaining shallot. Cook, stirring, until softened, 2-3 minutes. If desired, add a pinch of chili for spiciness; cook for 15 seconds. Add marinara and a pinch of salt and pepper. Bring to a simmer and cook for 2 minutes, stirring a couple of times. Turn off heat. Add spaghetti to pan with sauce; stir until thoroughly coated. Stir in half the Parmesan and 2 TBSP butter. 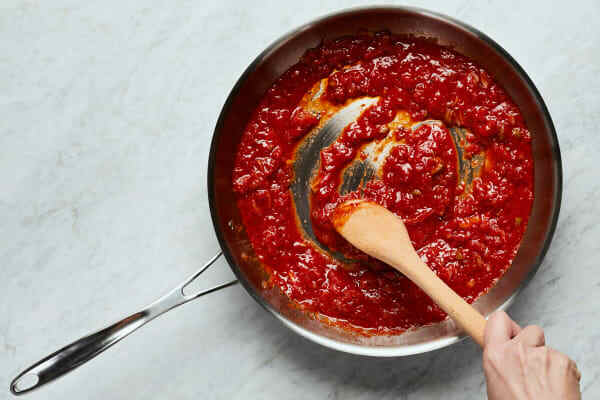 If sauce seems thick, add reserved pasta cooking water, 1 TBSP at a time, until loosened. Season with salt and pepper. Add arugula to bowl with dressing; season with salt and pepper and toss to thoroughly coat. Divide pasta between bowls. Top with remaining olives and remaining Parmesan. Sprinkle with a pinch of remaining chili (to taste). Serve with salad on the side and remaining lemon wedges for squeezing over.